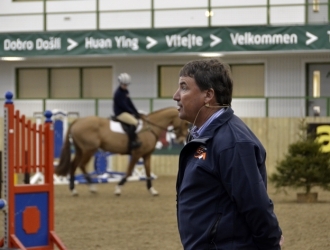 British Eventing has a new favorite coach, and his name is David O’Connor. 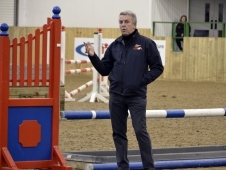 On Feb. 4, the new U.S. national eventing coach made a second consecutive visit to the annual International Eventing Forum at Hartpury College in Great Britain to demonstrate cross-country training. In the two days preceding the conference he also took the opportunity to work with British-based American riders Jules Stiller, Clark Montgomery and Tiana Coudray, and it was obvious that Coach O’Connor is thriving in his new role and busy schedule. He emphasized that the training for all three phases has to tie together. “It is the same horse, the same brain, so talk in the same way and make your priorities the same,” he said. His first priority was for the rider to get the right Direction and second priority the right Speed. 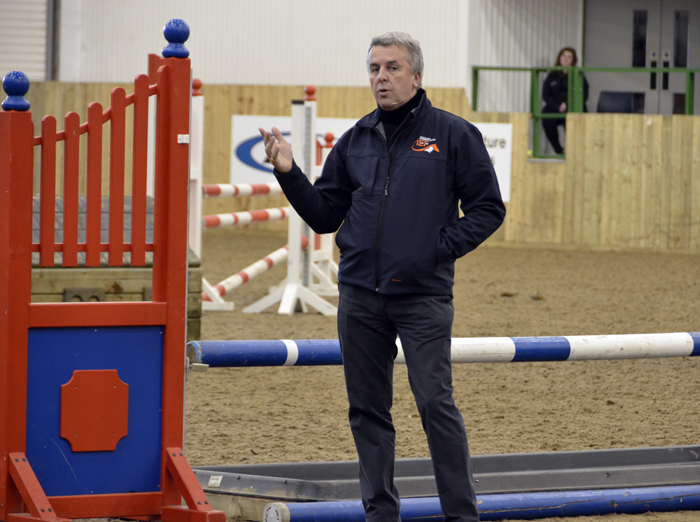 He showed that this applies to all levels of riders and used related distances and fences at an angle to show how you get the right ingredients to make each exercise easy and allow the horse to judge each challenge for itself and work for the rider. 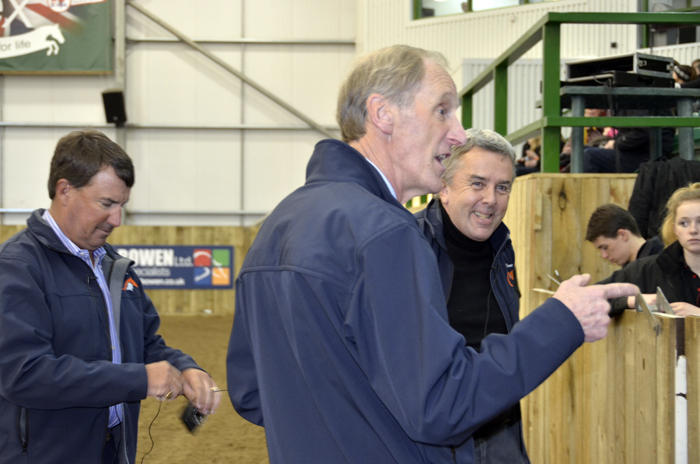 “The horse’s responsibility is to do the jumping, and to do this they need a clear view of the fence and a rider who leaves the horse alone in the last five or six strides,” said O’Connor. O’Connor and Etherington-Smith emphasized the “clear view” when discussing barriers, such as dense bushes, on a bending line of fences. 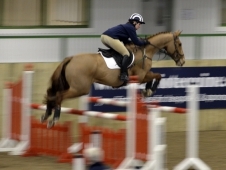 Both agreed that it’s not fair to the horse to use barriers before a fence on a turn above the sight line of the horse, preventing a view of the fence until the very last moment. He is also moving away from using steps out of water because he feels there is always an element of luck involved. 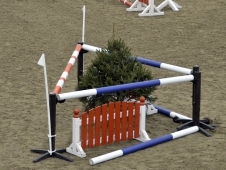 The other side of this coin is that Etherington-Smith believes courses should be made more difficult in two specific ways: First, he agrees with the views of many riders that there has been too much use of logs, solid corners and sloping profiles in the past, and that riders need to learn to jump verticals and open corners again and treat these fences with more respect. Second, he believes in reducing easy but time-consuming alternatives to fences as horses can otherwise progress without facing the right challenges applicable to each level. But he sees this as different from presenting different options at a fence where each option has its own appropriate demands. 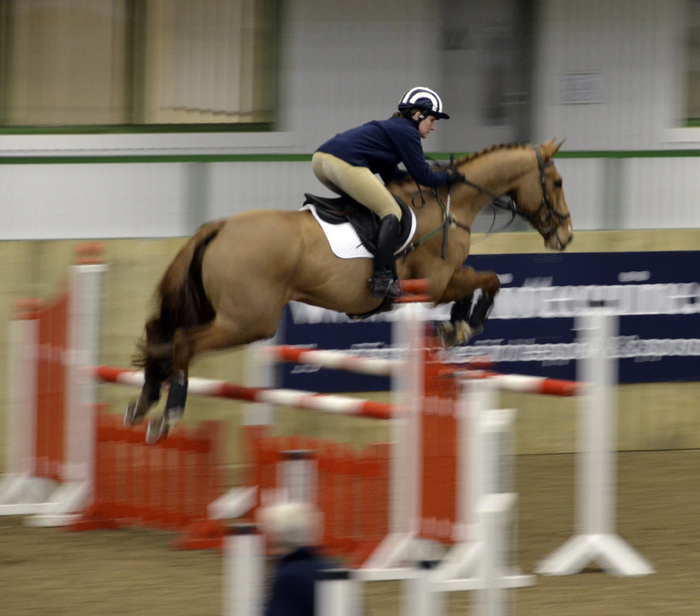 O’Connor showed this same fair approach to horses throughout his session. Everything was progressive, and in particular he worked backwards with his lines of fences. 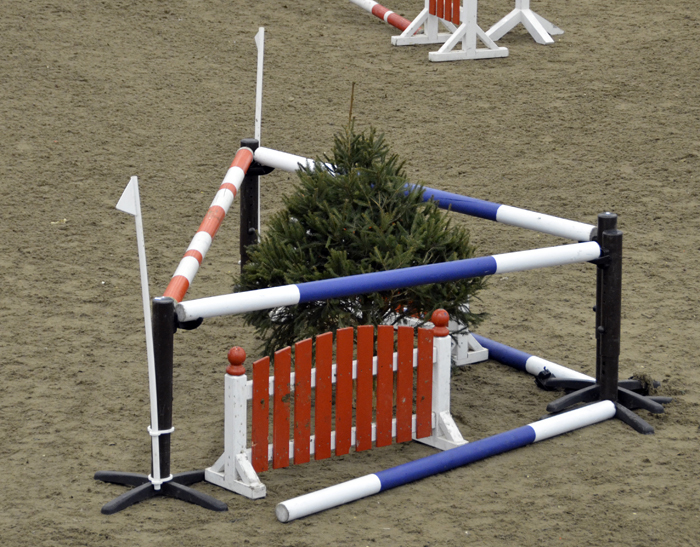 Horses always jumped the last fence first so that when the line was put together they knew where they were going and were drawn to the last fence. “Eyes are what I look at most,” he said. 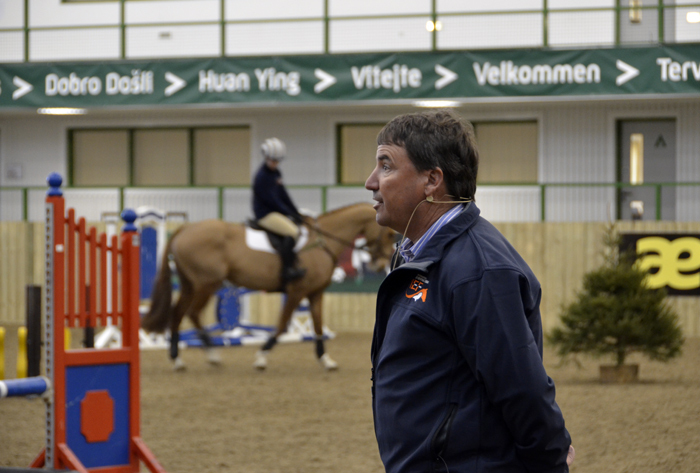 “Both horse and rider need to look ahead, and you can train a horse to lock on to flags so that you don’t have to hold them tightly to a line. They do the work for you. This is why I always put flags on narrow fences even when schooling. “It is important that the rider knows these priorities so they know whether something is good or bad,” O’Connor emphasized. “The first question I ask is: ‘Did you notice? Did you notice the horse move to the left? 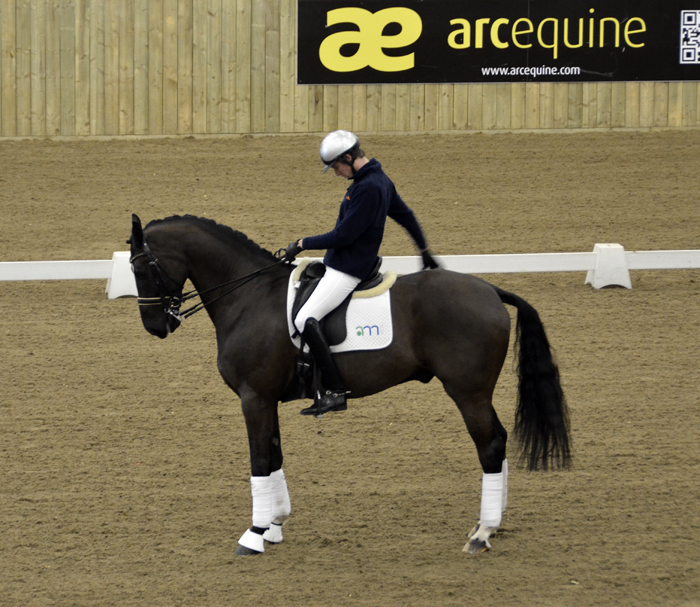 Did you notice the horse slow down?’ Then I ask: ‘Did you do something about it?’ Finally, I ask: ‘Did your horse react?’ Too many coaches leave out the ‘Did you notice?’ and as a result fail to make the rider independent. 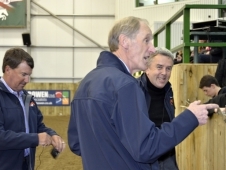 The core message from O’Connor was that an independent educated rider is set up for success and thus able to reduce the significant pressure of tackling a new level or a new track. And “the course designer has also done a great job!” concluded Etherington-Smith with a smile. Listening to O’Connor reminded me that he brings with him not just 30 years of his own experience at the highest level, but also the wisdom of those two great U.S. coaches Jack Le Goff and Bert de Némethy. To hear him talk of first getting the right Direction and Speed is straight out of their mouths, and his simplicity, precision and clearly thought-out priorities echo their coaching strategy. The fact that Le Goff and de Némethy influenced each other made both of them stronger and is a lesson for all modern coaches. One of the important topics Etherington-Smith emphasized was the difficult balance between minimizing risk and providing an appropriate test with sufficient challenge. The easy way out for course designers is to reduce the level of severity at each level, but the cross-country has to remain at the heart of the sport. The Fédération Equestre Internationale officials now intend to downgrade a competition if the cross-country is assessed to be too easy. The new FEI qualifying and grading system for all riders and horses should help ensure a more uniform level of competence at each level. 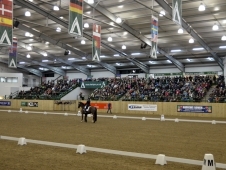 As FEI Eventing Chairman Giuseppe Della Chiesa said on the day, “The rider’s aim must not be just to compete to qualify at a higher level but to compete at the right level.” Certainly in show jumping this philosophy is now the norm, and there is an increasing sense from event coaches that this message is being understood and accepted and is making eventing even more popular. 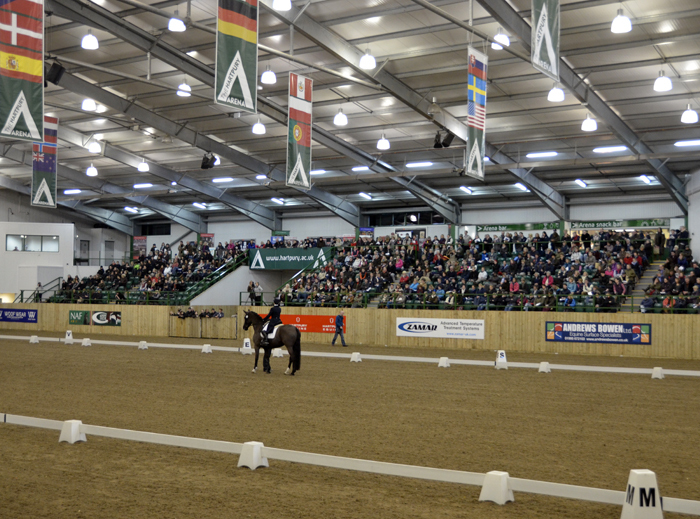 Over last five years the number of FEI eventing competitions has increased by 30 percent. Having been thought of in the past as the poor relation of dressage and show jumping, eventing is now increasingly seen as a significant player in both training and breeding strategies in equestrian sport as a whole at all levels.